When Audrey Fraser of the Association of Registered Nurses, Prince Edward Island contacted me to say she was seeking an “Inspirational Funny Motivational Speaker” for her nurses conference, I have to say I was intrigued because it is one part of Canada I had never visited. 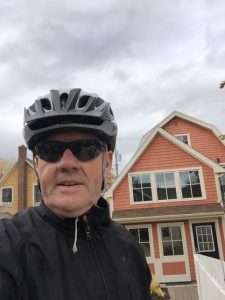 The quaint town of Charlottetown is a wonderful bike ride, although I was sometimes asking “What do I want my Attitude to be?” when cycling up hill against really strong winds!! I love telling this Attitude story whether it is presenting as a funny motivational speaker to nurses or as a motivational leadership to the c-suite, the message about choosing your attitude is powerful. I had an absolute blast speaking to the Association and was delighted to receive this wonderful testimonial from Audrey. 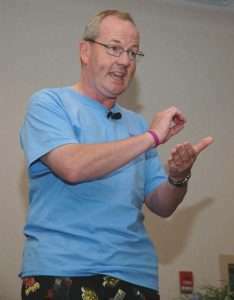 “Conor Cunneen was fantastic when he spoke to our 235 nurses. He nailed it on all levels: Learning, laughter, leadership, and always reminding us to keep the patient at the centre of our care. We were absolutely delighted with this Irishman and his pragmatic approach to life and business. Thank you so much Conor. Thanks to you, 235 nurses are now planning their goals, thinking about what their brand will look like, what their attitudes should be and so much more. Conor Cunneen – IrishmanSpeaks with a brogue to prove it! I love my work and I love speaking to nurse groups. If you like what you see here, give me a shout. You’ll find the brogue is real! !